Home / What is TPMS? The purpose of the tire pressure monitoring system (TPMS) in your vehicle is to warn you that at least one or more tires has suffered a significant change in air pressure, possibly creating unsafe driving conditions. The TPMS warning indicator is a yellow exclamation point that illuminates on the dashboard instrument panel. Not every TPMS works the same way. There are both Direct and Indirect tire pressure monitoring systems. Direct TPMS uses pressure monitoring sensors within each tire that monitor specific pressure levels. The direct tire pressure monitoring system wirelessly sends all of this data to the vehicles computer and if the tire pressure has significantly changed an alert is transmitted directly to your dashboard where the indicator light illuminates. An advantage of direct TPMS is providing the driver with actual pressure readings for each tire individually. An indirect TPMS does not use pressure monitoring sensors within each tire but typically relies on wheel speed sensors that the anti-lock brake system uses. These sensors measure the rate of revolution each wheel is making and can be used by on-board computer systems to compare with each other and to other vehicle operation data such as speed. Based on the rate of revolution of each wheel, the computer can interpret the relative size of the tires on your vehicle. When a wheel starts spinning faster than expected, the computer calculates that the tire is underinflated and illuminates the warning light on the vehicles dashboard. Indirect TPMS are not able to provide the driver with actual pressure readings. 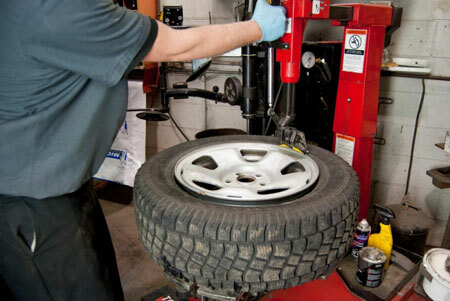 At The Tire Store ltd. our service technicians are properly trained to handle vehicles equipped with TPMS. If your TPMS is not working we can reset it for you or if necessary have the TPMS sensors that are malfunctioning replaced.